Writing and interpreting risk assessments, understanding safety distances, the handling and storage of dangerous goods… this is all bread and butter language and procedure for pyrotechnicians as we go about our work. However, there are times when an event organiser, venue manager or production company may not have the relevant in-house specialist knowledge, particularly when working with hot flames, sparks and explosions. In the months and weeks leading up to an event, organisers want to understand the nature of the stage sets and stunts being planned. They seek assurance to be confident that the risk assessments are robust and cover the relevant areas and eventualities. Having access to specialist knowledge is vital. 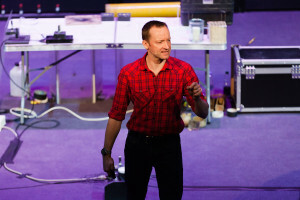 This is one of the reasons that the Cheltenham Science Festival production team approached Matthew Tosh; asking him to come on board as a consultant for the 2014 six-day festival. Matthew will be providing pre and live event support for the shows and awards ceremonies that involve so-called higher-risk stunts, tricks and demonstrations. He brings over eight years of combined pyrotechnics and live science presenting expertise to the Cheltenham team. High-profile science shows are incorporating more close proximity pyrotechnic and explosive effects to show off particular science principles, as well as enhancing the dramatic and visual aspect. These require an understanding of how the materials perform, detailed risk assessments and robust rigging techniques. A specialist eye also helps give organisers the confidence that safe rigging, storage and set-up procedures are being followed, particularly if any on-site changes or material substitutions need to be made at short notice. 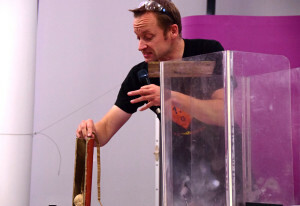 The Times Cheltenham Science Festival runs from 3rd to 8th June 2014. You can find out more and what’s on here. Bangs for the sake of bangs? I was prompted to write this article in response to a number of comments on social media channels in the past 24 hours about pyrotechnics and explosions in chemistry outreach and science communication activities. In case you’ve just arrived from an external site, I’ll declare my interest at the outset: I am a pyrotechnician as well as a science presenter. I am a physics graduate, not a chemistry graduate, but I use chemistry and rely on it in a lot of my work. I should also add that I broadly agree with the arguments against explosions for the sake of explosions – chemistry is far more elegant and a much broader subject and one shouldn’t attempt to represent it by a single type of demonstration… or a demonstration at all, as some may argue. I do not wish to reduce the debate to “are pyrotechnics and explosions per se good or bad?” A little of everything in moderation and used appropriately, works well. By appropriate, I mean not including a bang just for a cheap audience thrill and “getting them on side”. I’ve seen so-called “whizz-bang” lectures that are a cluttered collection of exothermic, brightly-flashing, smokey reactions with little or no structure and, quite frankly, they bore me. I’ve also been fortunate to see some very clever lecturers and teachers build suspense, with even some of the quietest of demonstrations (the first time I saw Nylon being made springs to mind). The challenge of a presenter or lecturer is to present a broad range of demonstrations representing different aspects of the subject. This is true for many subjects and not just chemistry. 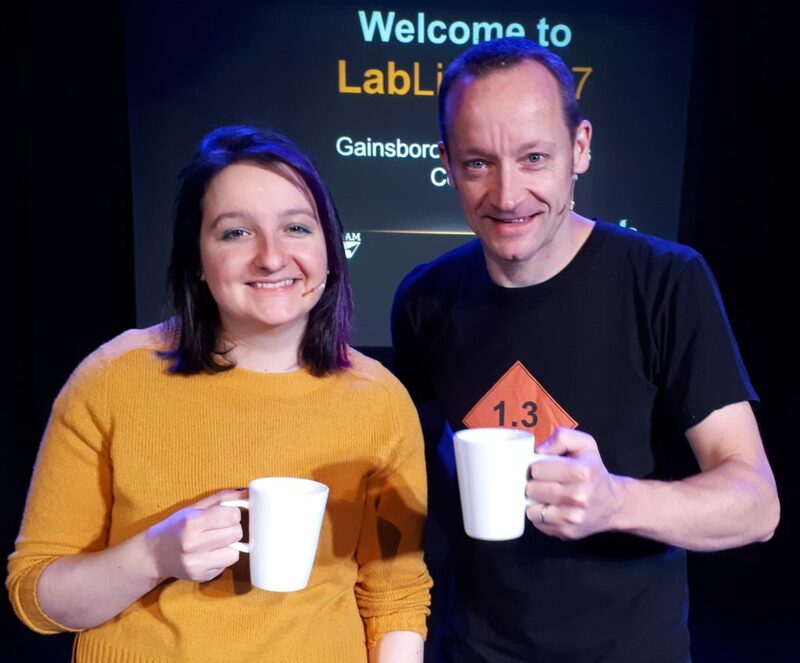 However, I am concerned at some of the paraphrased comments and questions I’ve seen flying around on social media networks today about how pyrotechnics could be perceived as a “terrible tool for chemistry outreach”. Pyrotechnics and pyrotechnic-type demonstrations (including explosions and stoichiometry demonstrations) cannot and should not be used as standalone representations of chemistry. It’s far too narrow an application. I think most people would agree on that. But let’s not forget that they do indeed represent valid and real applications of chemistry. I know post-doc chemists who have worked in pyrotechnics R&D and I spend a lot of time in muddy fields using their products. Pyrotechnic devices (as we call them in the industry) are tools. Any tools or devices can be used correctly, but they can also be misused. Misuse could be downright dangerous or irresponsible use (e.g as a weapon). It could also be including a bang or flash in a lecture for the sake of it because it’s chemistry and that’s what the audience expects to see. Overuse is a misuse. Audiences expect it because over the years we’ve allowed the bangs to become the main stars of our demonstrations and have hence allowed the perception to develop. 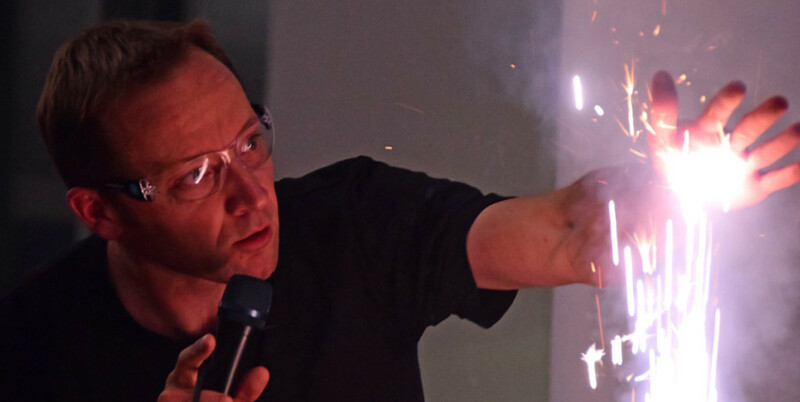 I am regularly asked to present lectures about the science behind professional firework displays and stage effects. My area of interest is how both chemistry and physics underpin the range of visual and aural effects, not to mention how we make it all happen with technology, engineering and maths. I’m absolutely clear from the outset that I’m presenting a very specific application of the sciences. The main aim is to highlight how Science, Technology, Engineering and Mathematics (STEM) play important roles in the creative and entertainment industries – pyrotechnics being just one aspect of this broader industry. In most of my lectures, I only include one actual explosion and its primary purpose is to demonstrate a physical principle; i.e. that of a supersonic shockwave. 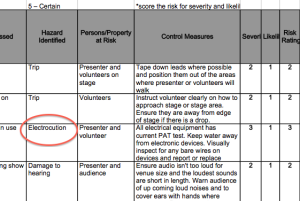 Yes, it’s loud and the maximum pressure is selected to match the size of the venue and age of the audience. I won’t lie; it’s a great demonstration and I really enjoy doing it. It usually features in a series of demonstrations relating to reaction rates and rates of energy release. However, if I’m not doing anything about shockwaves, then I rarely include an explosion. The colour chemistry can get very detailed, depending on the age of the audience I’m talking to. 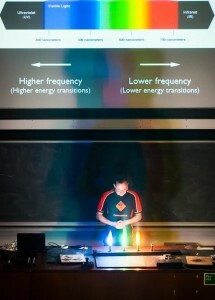 It’s a great way of demonstrating aspects of physical chemistry, electron energy levels and competing emission spectra. Pyrotechnic whistles are fascinating, but bizarrely illustrate more physics than actual chemistry. I’m trying not to sound too defensive. 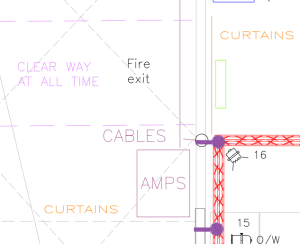 I am obviously biased towards pyrotechnics as I’ve been working with them for over seven years. My passion for them is driven by the fact that there is a wealth of chemistry and physics at play behind the scenes. Chemistry cannot be communicated with pyrotechnics alone, but to badge them broadly as a terrible tool for chemistry outreach is misleading. 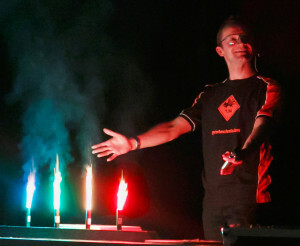 If deploying carefully selected pyrotechnic effects and demonstrations helps open a young person’s mind to some of the possibilities and wider applications of the STEM subjects and why it is important to get a good GCSE grade (or equivalent) in these subjects, then I will have achieved my aim as a science presenter. A terrible tool? I’d argue that it is the operator who is at fault, not the tool.